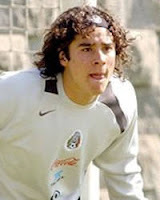 El Espectacular - The South American Football Blog: Ochoa set for Manchester United Move? Ochoa set for Manchester United Move? Club America goalkeeper Guillermo Ochoa has claimed that Manchester United are in negotiations to sign him for 10million Euros. Ochoa, 22, is a full Mexican international and is highly regarded due to a string of excellent performances for club and country. His form has been instrumental in Club America's run to the Copa Sudamericana semi-finals, including a heroic display against Vasco da Gama in the second leg of the quarter final. Manchester United are thought to be looking for a long-term replacement for Edwin Van de Sar and it would seem that Ochoa might just be the man to fill the Dutch keeper's gloves. It is thought that Ochoa will sign a three year deal if negotiations are successful between United and Club America, and will join the Premiership side in January.